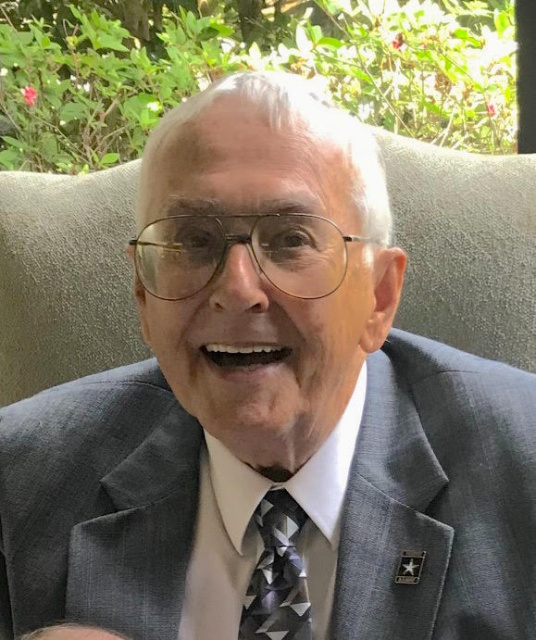 Robert W. Ruark passed away with family by his side on December 1, 2018. Bob was born on October 2, 1930 in Greencastle, Indiana to parents Ola and Dallas C. Ruark. He played basketball and graduated from Dana high school, served in the army during the Korean War, and then graduated with a Mechanical Engineering degree from Purdue University. Bob began his career as a young engineer at Link Belt Co. in Chicago, Illinois. It was there that Bob was interviewed by Asst. personnel director Virginia Erickson, who would become his wife. Bob and Virginia (and the two daughters that arrived) followed his quick career path to companies in Aurora Illinois; Wake Forest, North Carolina; and Clintonville, Wisconsin before Bob decided to start his own company. Mr. Churchill Williams and other leaders in Oelwein, Iowa convinced Bob that Oelwein was the right place to start his new conveyor business, ABCO Engineering. ABCO began in 1967, just in time to be completely leveled by the category 5 tornado that hit Oelwein on May 15, 1968, and for a while conveyor equipment was built in the open on the giant concrete slab that was left. With the help of many friends and the Oelwein Industrial Development Corporation, ABCO was rebuilt in a new location and began to flourish. On October 19, 1975, ABCO was destroyed by a devastating fire, but Bob again rebuilt the company. During ABCO’s peak years, Bob added recycling and farm machinery divisions and shipped product all over the world. Bob was an enthusiastic small business advocate and enjoyed serving on the Executive Board of Directors of the Iowa Association of Business and Industry, President of Iowan’s for Right To Work, and as Chairman of the Oelwein Airport Commission. Bob had a lifelong obsession with airplanes and flying, which culminated in his obtaining his private pilots license. He purchased a small airplane and delighted in giving free plane rides to anyone old or young. He was an excellent pilot, and his family concluded that it was likely safer to ride with him in a plane than in his car. He was part owner of a glider and eventually purchased an “ultralight” aircraft (basically a lawnmower with wings). The lawnmower in the sky could be seen and heard around Oelwein until Bob finally crashed it in a plowed field. He walked away with only a minor ankle injury. Bob’s sense of fun and adventure (and his sense of humor) continued for all of his 88 years. Bob’s health had been in decline and in February of 2015 he “retired” from his beloved company after 47 years. The family is grateful to Doug Bryan, who continues Bob’s legacy as ABCO Manufacturing. After his wife Virginia passed, Bob moved to Texas in the summer of 2016. He happily joined in on the family fun… boating and fishing, “seniorcize” exercise classes at the YMCA, monthly gospel music concerts at the Liberty Opry, and of course feeding the large flock of peacocks that showed up at his home every day. The family is so very grateful for the many sweet people who have surrounded him with love and community. Bob leaves cherished memories with daughter and son-in law Trish and Bill King of Crosby Texas and daughter and son-in-law Ginny and John Wessels of Lawrence, Kansas; granddaughters Kelsey King Ryan (Andrew) of Houston, Texas, Jenica Wessels Harwood (Sam) of Lawrence, Kirsten King Gay (Trent) of Houston; Grandsons Joe Wessels (Brittany) of Lawrence, Sam Wessels of Portland, Oregon, and Thomas King (Jai Morgan) of Sydney, Australia. He was “Grandpa Bob” to Jean Dutko Veryns and Jackie Dutko Secrest. He was “Great” to great-grandsons Bennett, Beckham, and Bowen Harwood and great-granddaughter Elliot Gay. Bob is survived by his brother Gerald (Cork) and sister-in-law Ann (Nan) of Indianapolis, Indiana, and sister-in-law Barb Anderson of Longmeadow, Ma. He was preceded in death by his wife, Virginia, and stepson, John Dutko. A celebration of life will be held at Geilenfeld Funeral Home on Friday, December 14that 11:00am with reception to follow. The family requests that you come to share your special memories of Bob. In lieu of flowers, memorial contributions may be made to Stanley Union Church or the MDS Foundation. My thoughts and prayers are with you and your family. I remember you as a second grader in my first classroom at Harlan Elementary School. I also remember coming to your home for dinner with your wonderful family. Special prayers to you at this difficult time. To both Ginny and Trish: I met your Dad in the summer of 68. He came to look at the building my Dad had put up after the Tornado to compare whit what his contractor was doing. While waiting for his Contractor to show up we had a great conversation, mostly one sided from him. He stressed to me the importance of education and also how i was a very responsible person for my age. My favorite memory was when he bought the building behind Escarino's laundry and painted it Purple with yellow polka dots to make a point to the city and the building code laws it was introducing at the time. You could see it from the front door of City Hall as you were leaving. Very Sophomoric humor but I loved it. I am sure not very many people know of all the good things and help he gave to different students and families in Oelwein anonymously. To me that is really his greatest legacy. May Bob and Virginia rest in peace. They were great for Oelwein and provided careers for a lot of people. ABCO was my first job after I graduated from college & I have fond memories from the five years I spent with the company. I will be forever grateful to Bob for funding the majority of the expense for my Dale Carnegie training when it was held in Oelwein. It had an impact on my career after I left ABCO. I can't attend the memorial but I would like to share a memory. Bob loved his sweets especially divinity. I remember Bud & Tim making a plate of divinity out of potash. Before they could get the words out to stop him, Bob grabbed a piece of "divinity" & took a bite before he started sputtering. I enjoyed Bob stopping by the Wiener Works stand on the 4th of July to catch up. My husband Dave also had some chats with Bob at air shows when he & Church Williams would attend years ago. I'm glad Bob enjoyed his last few years in Texas with his family & I can picture him "seniorcize" the YMCA exercise classes with that big smile. My sincere sympathy to the entire Ruark family. Enjoyed having parent teacher conferences with them and truly enjoyed having both of you, Trisha and Ginny, in my classroom. Cherish the memories you have of both your parents and be sure to tell the grands and great grands the growing up experiences from your childhood. I am in Michigan enjoying my two grandchildren this holiday season, so will not be able to see you on Friday. Please know that I hold you in my prayers during this stage of Dad's life. Blessings! Trish and Ginny so sorry to read about your dad.He was such a caring man. He and Virginia were such a special couple. I will keep the family in my prayers during this difficult time. Heartfelt condolences to the Ruark family. Will always remember Bob as a sweet man and genuine family friend. I worked with your father for many years. Bob was passionate about ABCO and the products ABCO produced. But, I will remember him as a man who ran a business because he felt responsible for the welfare of his employees and their families. Condolences to you, your family, your sister and her family. Your dad was an inspiration and mentor to me. I loved his big smile, hearty laugh and entrepreneurial style. He was a risk taker and loved to push the limits. You are his "mini me"! I'm looking forward to getting caught up with you next Friday. I have some airplane stories to tell! business associates and will be missed by all. Good friend. My condolences to the Ruark family, Trish & Ginny your father was truly an inspiration to all that knew him. A unique and special friend.